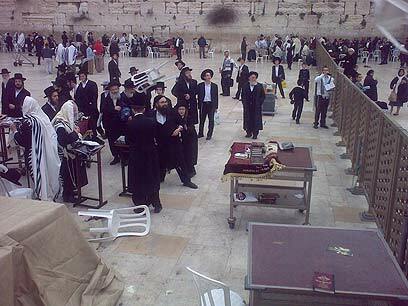 Police arrested two haredi men at the Western Wall compound on Tuesday on suspicion that they threw chairs at a group of praying women from the "Woman of the Wall" organization. The men were taken for questioning, and the women continued their festive prayers to mark the first of the month of Nissan. The incident occurred just before 7 am when the first women of the regular minyan had already arrived but not yet laid tefillin or begun praying. They waited on the upper area of the enclosure for the others to arrive and a group of haredi men gathered in front of them on the other side of the barrier that separates women from the men's praying area. "Suddenly there was tension and something like 10 chairs came flying towards us, and two even got broken," Women of the Wall Chairwoman Anat Hoffman told Ynet. She said that the timing of the protest, when they were just standing and waiting for prayers to begin, shows that it was carried out by a group who had come especially to provoke. "There was a rabbi there who shouted with a croaky voice, 'See what it means to be a real Jew,' while those around him were like his followers," Hoffman said. "As soon as we called the police, about 40 police officers arrived and formed a human barrier between us and the haredim." In the end the women succeeded in holding an "excellent" prayer session with about 70 participants. "In recent years the Western Wall has become a haredi synagogue," said Yizhar Hess, executive of the Masorti movement. "Anyone visiting the site notices the changes. The separation between men and women starts even at the security gate, with a special passage for men only to the men's enclosure, so they won't have to go through any public space where there are both men and women together." "They treat women as if they were untouchables," he continued. "The person known as the 'rabbi of the Wall' is very efficient in his work. He is the rabbi of haredi men who do whatever they want at the Wall." "The struggle of the Women of the Wall is not just for the sake of their own ability to pray, but for the sake of anyone who fears for Jerusalem's wellbeing," Hess added. See all talkbacks "Haredim throw chairs at praying women"